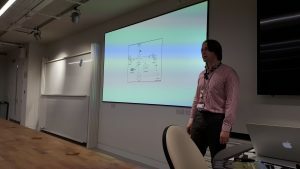 UK Polar Network | The UK Polar Network organises skill development workshops and education and outreach opportunities for early career polar research scientists. Association of Polar Early Career Scientists in Russia (APECS Russia) and UK Polar Network together with Kola Science Center of the Russian Academy of Sciences invite you to attend an interdisciplinary field course in the Russian Arctic - "Arctic Interdisciplinary Studies - ARCTIS". ARCTIS will cover main domains of disciplines: Atmosphere, Cryosphere, Terrestrial, Marine and Social & Humanities. The main goal of ARCTIS is to facilitate bilateral and interdisciplinary cooperation of early career scientists from the United Kingdom and Russia on Arctic natural and social studies. The course will be designed to create a fruitful and interactive platform to share ideas, exchange knowledge and gain new skills and experiences by developing collaborative science project concepts as a result of the meeting. The field course will take place in Apatity, Kirovsk and Murmansk, Murmansk region, Russia. To apply for the field course, click here. Applications are invited from early career researchers (from PhD level to 10 years post-PhD) with an interest to marine stations to participate in a side-event during the Marine Research and Education Conference in Moscow, November 21-22, themed “Interdisciplinary marine research in the Arctic and Northern Atlantic Oceans”. The event is in collaboration with the UK Polar Network, the Marine Research Center of Lomonosov Moscow State University, the UK Science & Innovation Network and NERC Arctic Office. Workshops will be held at Moscow in the Institute of Oceanology with travel and accommodation support available. Please download the conference schedule and application form linked at the bottom of this post (to save the files you can right-click and print to PDF). The application deadline is midnight (GMT) on 17th September, 2018 (i.e. 00:00 18/9/18 GMT). Please return completed application forms to to applications@polarnetwork.org for UK-based researchers or to info@maresedu.com for Russian-based researches with a title UK-Russian side-event. Do you write any code? Have you ever come back to your code from 6 months ago and had no idea why it doesn’t work any more (or what it even does)?? Does your code mysteriously stop working overnight even though you’re sure you didn’t change anything? Do you ever wish you could get back your lovely code from last week that worked just fine before you changed it? Do you use (or will you use) any kind of software in your research at all? If you answer yes to any of the above then this workshop is for you! 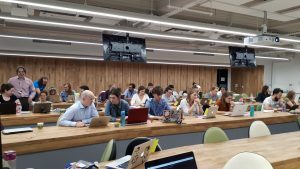 * We are holding a free day long workshop at UCL on September 18th on polar software which will cover everything from version control and writing better code to specific software used in polar research. We have a range of brilliant speakers from academia, as well as some who have taken the software skills they have learnt from academia into industry. This workshop is for all early career polar researchers no matter your level of experience, masters, PhD and beyond and has been partially funded by the Software Sustainability Institute. 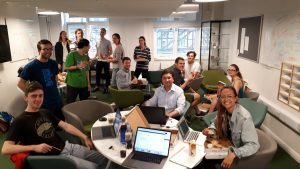 We also encourage participants to stay for our polar sciences hack day on September 19th- we will be joining with students from other disciplines (e.g. 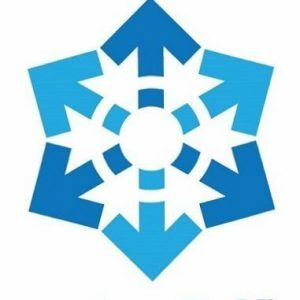 physics, computer sciences) to come along and work on some polar problems for a day so even if you don’t think you’re great at coding here is your chance to get some help from those who are, and put into practice the skills you learn during the workshop. I’ve been a member of the UKPN for 5 years now, I joined the committee as the education and outreach officer in 2013 and have since helped organise and lead outreach activities across the UK. 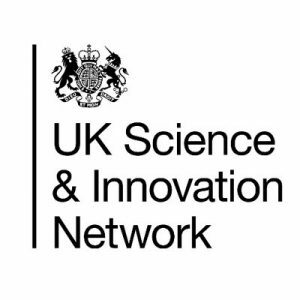 The network and its meetings have been a great source of peer networks throughout my PhD and I was most grateful to receive a UKPN donation toward my Homeward Bound Expedition to Antarctica this year. 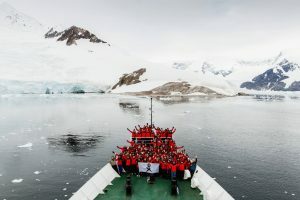 Homeward Bound is an international leadership initiative for women in science, the programme is delivered over a 12-month period training the participants in science communication, leadership, personal strategy and visibility, culminating with a three-week expedition to Antarctica. A total of 78 women from 14 different counties and different STEM fields took part in the expedition which visited Antarctica in February-March 2018. During the expedition I could network with the other Homeward Bound participants, gaining contacts around the globe and insight into different scientific disciplines including conservation, policy, education and sustainable technologies. This was an amazing experience and opportunity. Science working groups within the 2018 cohort are now planning initiatives to help improve the gender gap in science, reduce our impact on the planet and raise awareness of climate change. Antarctica was chosen as the backdrop of Homeward Bound because of its isolation and vulnerability. Training in this environment, removed from everyday life and communications, where our impact of climate change is so visibile, underlines the growing need for international collaboration to help future generations live more sustainably. 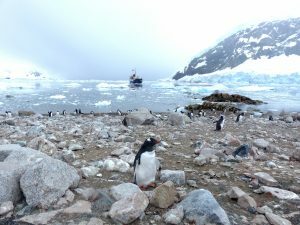 During the expedition we visited 4 different research bases; Carlini (Argentina), Great Wall (China), Palmer (USA) and Rothera (UK) as well as sites of historical importance; Port Lockroy and Base Y (British) and other locations of biological interest. As many UKPN members will be aware, visiting the polar regions is a unique and very moving experience. Being able to visit so many bases is also very rare. Having studied Antarctic biology for the last 6 years during my masters and PhD, I was really excited to see Antarctic science in action and learn more about operations in the field. These insights will feed back into future outreach work, helping to inspire young peoples into STEM subjects. Once again I am really grateful for the support of the UKPN and as I move onto the next stage of my career (I finished my PhD 3 weeks before my expedition), I hope to take these newly acquired skills into my future work. The Homeward Bound program is a 10 year initiative and for any UKPN members or followers thinking of applying, I am more than happy to discuss my experience of the programme and help with applications. On 1-2 March the 1st UK-Russia Arctic Early Career Researcher Workshop will be hosted at Moscow State University hosted by the Faculty of Geography and Marine Research Center. The event is organised by the NERC Arctic Office and the UK Science and Innovation Network in Russia, in partnership with the UK Polar Network and the National Committee of the Association of Early Career Polar Researchers in Russia. The event is aimed at building practical connections between early career researchers from the United Kingdom and Russia, with the aim of promoting international scientific cooperation and identifying avenues for future joint UK-Russia Arctic research. The programme of the workshop features a series of presentations from participants, discussions in break-out groups and visits. The event will be held under the UK-Russia Year of Science and Education 2017. 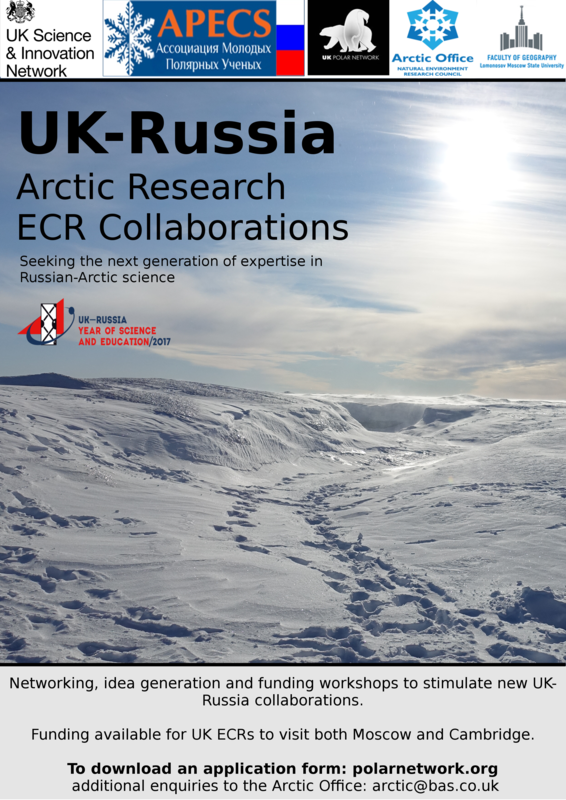 The UK Polar Network invites applications from UK-based early career researchers (from PhD level to 10 years post-PhD) to participate in and foster research links through collaborative workshops in the Russian Arctic. These events are in collaboration with the UK Science & Innovation Network, APECS Russia, NERC Arctic Office and Lomonosov Moscow State University. Workshops will be held at Moscow and Cambridge with travel and accommodation support available. 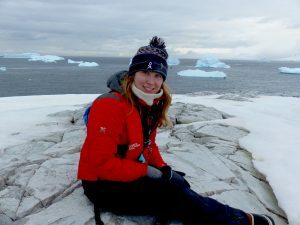 On Wednesday 20th September, during the UK Arctic Sciences Conference, the UK Polar Network will host an early career panel event. The theme will be "International Collaboration" to tie in with the theme of this years Polar Week, organised by APECS. The panel will be held between 18:30 and 19:30 in the Oban Inn (Stafford Street, Oban). We will be at the venue from 18:00 to 20:00, and food will be available to order at the bar. Panellists include Dr Jon Cohen (University of Delaware), Dr Helen Findlay (Plymouth Marine Laboratories), Dr Tom Brown (Scottish Association for Marine Science), Dr Jo Browse (University of Exeter), and Henry Burgess (UK Arctic Office). Please join us for this early career event (generally undergraduate to post-doctorate level, but we're not very exclusive). Contact Laura Hobbs (laura.hobbs at sams.ac.uk) for more information. 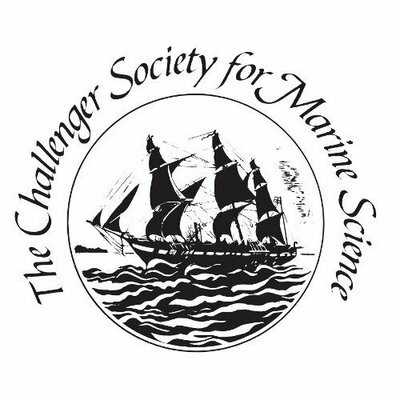 During the recent BAS workshop in Cambridge the UKPN facilitated a competition for a polar science outreach proposal. The project "Sounds of Change: Greenland Ice Sheet Melt" was picked for it's original idea. 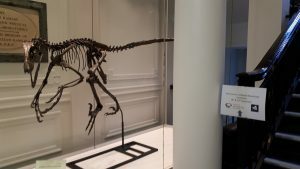 We wish to congratulate Heather Bell (Durham University), Joseph Nolan (Netherlands Organisation for Scientific Research), and Zuzanna Swirad (Durham University) for this achievement and we are looking forward to support their efforts realising the proposed project. The project aims to produce an open access digital soundscape documenting the melting of the Greenland Ice Sheet. The project organisers plan on using mostly ambient noise which has already been recorded and is available in archives and from polar researchers who undertake fieldwork in Greenland. The soundscape will travel from the interior of the ice sheet following researchers in the field, on a route out to the ocean with the sounds of rivers in flood, iceberg calving events and the impacts that the melting of the Greenland Ice Sheet is having on local inhabitants. They hope that this resource will be used in schools and alongside museum or art exhibits. Please get in touch with the UKPN or the project leaders if you have some interesting recordings you wish contribute to this exciting project or would be willing to document some soundscapes during your upcoming research trip.